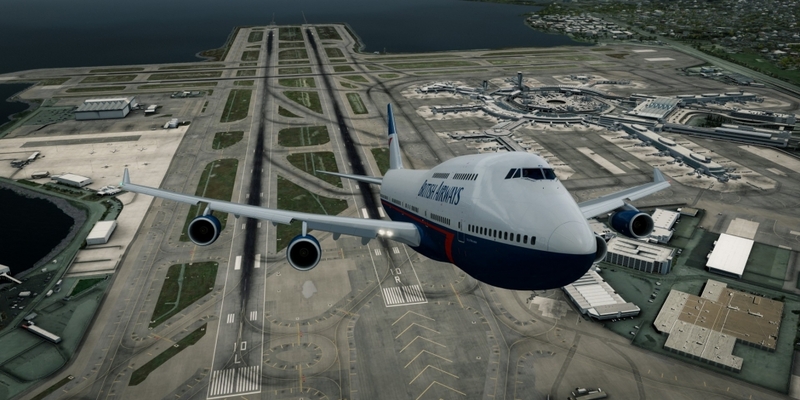 San Francisco International – a great airport and a significant place in the history of aviation. For P3D by FlightBeam. Amazing work on a marvelous destination. This is an update of a review written in January 2016. 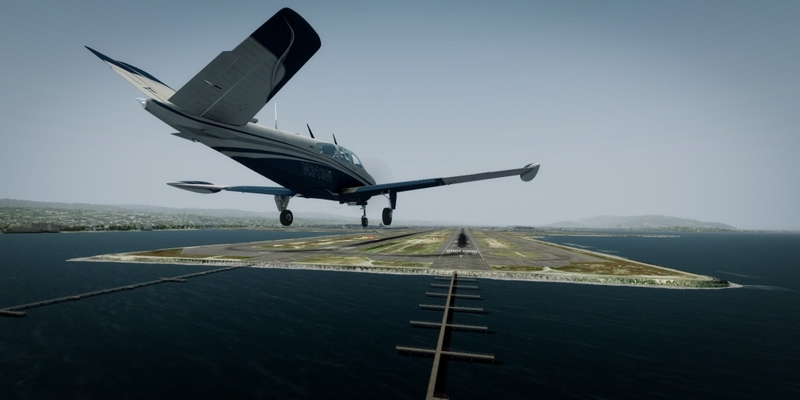 I enjoy the visual effects and performance of the P3Dv4 – which I would like to share with you. I also added paragraphs and dropped parts which repeated the information published on the FlightBeam’s website. I think the review will be more interesting with these changes. 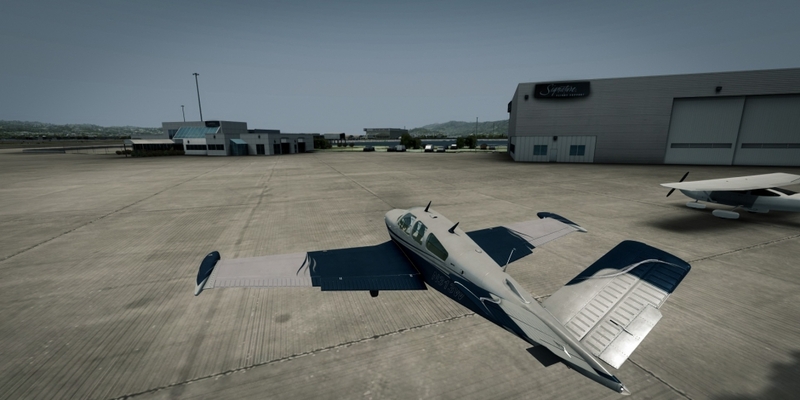 Flying a Bonanza to San Francisco International Airport? Why not! But first – consider some problems. Landing on 28R means a long taxi time. It is roughly 2000 meters from touchdown zone to FBO. Requesting ATC clearance for long landing may shorten this. Long landing is worth your consideration on runway 1L. 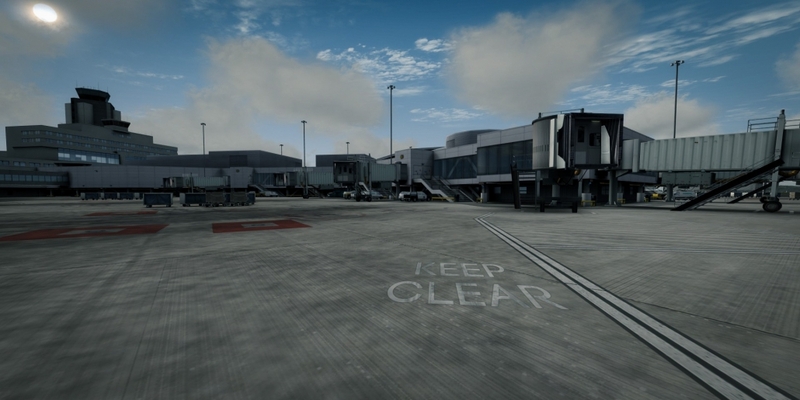 What I wrote applies to each runway in KSFO – I assumed that the ATC will place a slow plane on a more convenient one. Another factor you need to consider is cost. Landing and FBO fees amount to $300-400. Not so unusual price in Europe (landing at small Katowice Airport – EPKT will cost you over 250 Euro and don’t even try to compare this with Switzerland) but in the US it is a horrendous cost. In San Francisco International the only place where the pilot of the Bonanza can park is Signature – FBO serving business jets. They calculate the landing fee based on the minimum weight (for calculation) of 35,600 pounds. Up to this weight, you pay a flat fee. If you need to buy fuel, pay $8.26 (as of January 2019) for every gallon of 100LL. At San Carlos, nine miles away, the price is $4.95. They parked several Cessnas among the bizjets at FBO’s parking, so I felt at home here. In the real world, you will rarely see a single engine prop plane here. I’m missing details and clutter here. I have the impression that airliner stands and gates have been worked on more. This is by far the best-designed airport I had the pleasure to use in the simulator. I mean the real arrangement of taxiways and runways (reproduced in the scenery). Two crossing pairs of runways (10-28 and shorter 1-19) make the core of the airport with parallel and perpendicular taxiways supporting them. With the apron in the south-west corner of the entire system, it is almost impossible to lose orientation. It is still worth following the signs not to miss the turn, but still – it is much easier to find one’s way here than in Amsterdam or Stockholm (just to name two examples). 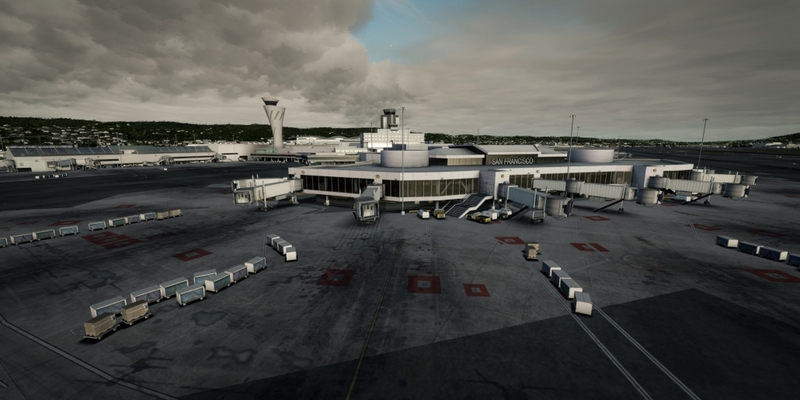 Terminals also maintain a geometric order with buildings that extend parallelly, perpendicularly or at an angle of 45 degrees to the main axes of the airport. 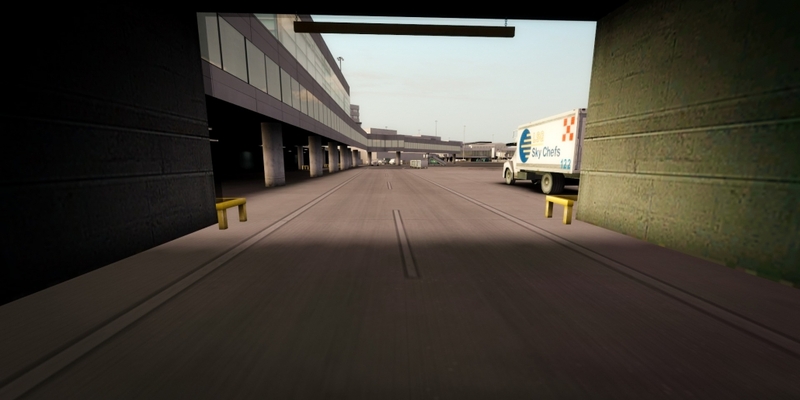 Only Cargo pilots will feel thrown out to the outskirts – especially those who use the cargo plate in the northern part of the airport. There is something terrifying in this order and the scale of the airport. I use small and medium airports most of the time. I am used to specific distances from buildings and from signs. Here there is… more of everything. Runways are wider, taxiways too. Buildings seem further away. And the distances are greater (make sure you calculate taxi time and taxi fuel). This affects the comfort of me steering my 747-8 on the ground – I have plenty of space, but even a 737 seems small – inadequate. Like a miniature airplane lost in space. Bonanza was a joke. You might have noticed this. The airports I visit are empty with only a few static planes around me. In small airports, this is enough to fill the space. Here the developer parked static planes on general aviation apron only (which is an improvement over Phoenix of the same developer where the parking in front of the FBO was empty). Loneliness on the airport is a choice – I do not use AI add-ons, and I never saw enough planes on Vatsim to fill a place big like KSFO. Although not that important for me – I checked how developers marked the parking spaces – they assigned stands to airlines. As far as I could verify it – correctly. 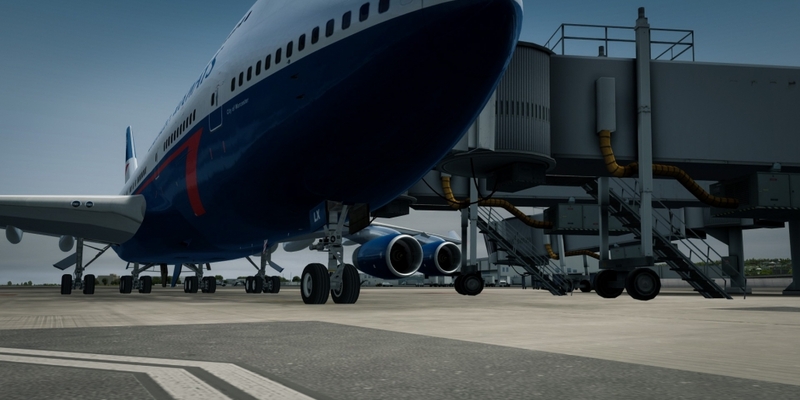 If you use advanced AI traffic add-on – aircraft positioning should satisfy you. While taxiing to a stand in San Francisco, I noticed the inside of the terminals – only slightly marked when I looked from the cockpit. I do not praise developers for this detail – I think building interiors lower performance, and their visual value is just average. Here, the combination of not entirely transparent glass with low-resolution interiors gives a good result. I like it. Though, do not go for a walk through the terminal. 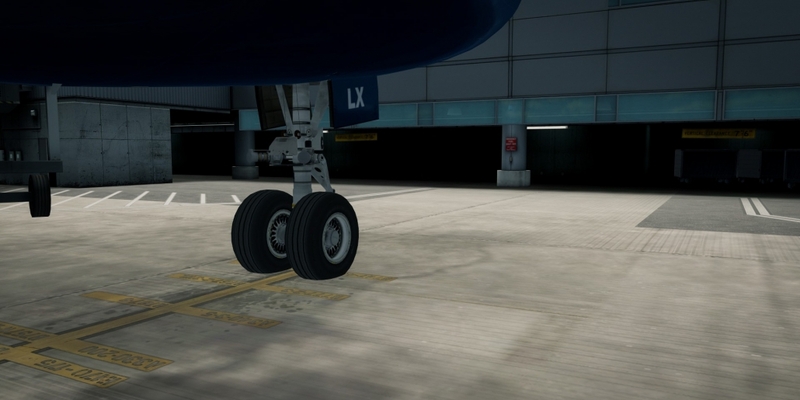 Intrigued by these elements, I looked more closely and explore elements that caught my attention during landings. That is why it is good to fly a small plane like Bonanza into a big airport- it is worth to fly such a plane even to a big airport – you will see much more than from a jet stabilized on the ILS approach. Flightbeam showed great attention with how they created a tangle of roads and railways leading to the airport and entangling the terminals. Nothing unexpected – I already praised similar features in Phoenix – especially the AirTrain. San Francisco uses a similar mover. AirTrain, a small automatic railway, operating Bombardier Innovia APM 100 dual carriage cars. Driverless cars circulate the airport on two lines at intervals of two-and-a-half minutes from each other. I confirmed that the color and appearance of the cars agrees with what they use in the real world San Francisco. Late in the evening an Airbus A320 Air Canada’s flight number 759, was approaching runway 28R. At 23:56:01 the United Airlines pilot taxiing on the taxiway C shouted over the radio “Where is this guy going? He’s on the taxiway.“Philippine Airlines, behind, turned on his landing lights as a warning. ATC ordered to abort. Too late, the Air Canada pilots have already aborted. They passed just 5 meters over the A340’s tail. Had they waited for ATC‘s command – the incident would end with countless deaths as several airliners packed with passengers were on this taxiway. The investigation identified a number of factors that lead to this situation. These include pilots fatigue, no additional means of confirming the correct flight path (like a set ILS frequency) on a visual approach. Lighting of a 28L that was under construction was misleading. Based on the accident reports, I found it difficult to imagine what things could have gone so wrong. How an experienced pilot mistook the runway (one of two parallel) with a taxiway? When approaching runway 28 (L or R) pilot sees four parallel surfaces – with two runways in the middle and taxiways to the sides. Taxiways are almost as wide as runways. With low visibility (at night) and with an old recollection of this approach (first landing here after a long break), I would (in the sim) rely heavily on the lighting. When both runways are active – the approach lights mark both runways. Besides, with the difference between the lights you can distinguish them – MALSR lights for 28L and more intense ALSF-2 for 28R. If one runway is inactive, the situation changes and the pilot could take the taxiway for the runway. 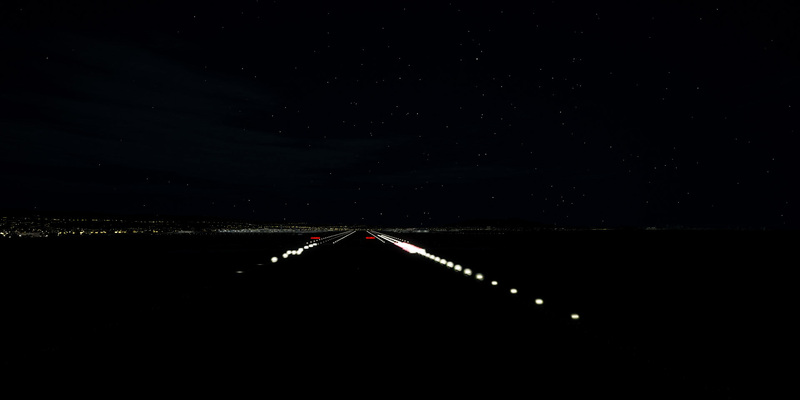 I can not turn off the lights of the left runway in the scenery. Even so – it’s worth doing a few approaches to 28R in various conditions to think about how tired crew must have been to make such a mistake. This is the aspect of flight simulation that seems the most attractive – I can try to understand what is happening in the air. Here – I still find it difficult to understand, but the scenery helps me imagine how the event progressed. I spent 2.5 minutes waiting for the Air Train wagon to arrive at the station on time. There was an 8-second delay. This is the biggest flaw of scenery I noticed in 3 years I am using it. That should be enough for a summary.